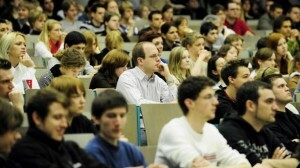 College students attend a lecture. Job seekers with a four-year degree were less likely to be unemployed during the recession than those with a high school education or less. Workers with less education lost about four out of five jobs in the recession — and nearly all of the jobs added in the recovery are going to college graduates. That’s the latest from the Lumina Foundation and Georgetown University’s Center on Education and the Workforce. Yes, recent college grads have struggled more than usual to find jobs matching their training. But overall, even as unemployment was rising past 10 percent, the authors found the economy actually added 200,000 jobs for workers with a bachelor’s degree. Since the recovery began, it’s created 2 million more. Just as there wasn’t really a recession, at least in terms of job creation, for those with college degrees, there hasn’t been a recovery for those without them. Nearly 6 million high-school-only jobs have been lost since the downturn began, and they are still declining even in the recovery. One reason for the disparity: Nearly two-thirds of the jobs lost in the last four years were in construction and manufacturing. Those fields are bouncing back, but the jobs they’re adding now require college degrees. We’ve reported before that another Georgetown study predicts Indiana could lose nearly 50,000 blue collar jobs by 2018. The state is likely to add nearly 80,000 jobs over the same period, but in industries that require at least some college. Those with a high school diploma or less lost 5.6 million jobs in the recession and another 230,000 in the recovery. Those with an associate’s degree lost 1.7 million jobs in the recession but gained 1.5 million during the recovery. Those with a bachelor degree or better gained 187,000 jobs during the recession and another 2 million during the recovery. According to the AP, unemployment is higher for recent college graduates (6.8 percent) than it is for all four-year graduates (4.5 percent). But nearly a quarter of recent high school graduates seeking jobs are unemployed. So does that mean the cost of college — more staggering than it’s ever been — is worth it? The report’s author, Anthony P. Carnevale, says yes. Lifetime earnings for four-year graduates with a bachelor’s degree are nearly double what they’d make with a high school diploma. But Carnevale adds a caveat: Gone are the days when any old degree will do. College students need to think carefully about their field of study and if they’re pursuing a degree for work in a shrinking industry.